- Students project "Virtual reality and GIS for transporation"
The Joint Laboratory of System Reliability (LSS) has been working on the research in the field of HMI and drivers' behavior for several years. Several studies dealing with the human operator's vigilance and/or attention decrease have been done in our laboratory. Beside those general tasks concerning the HMI we are focused on the tasks of the interaction between human drivers and motor vehicles (car drivers, rail engine drivers and so on). Two 'light' (i.e. composed of car cockpit only) and two 'compact' (i.e. 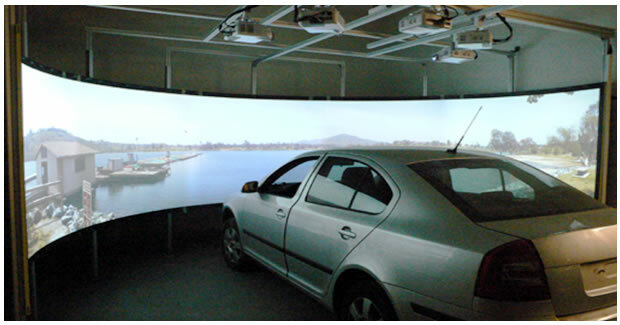 created from full car body) driving simulators are involved in the work of the laboratory. One light and one full simulator are under construction now and should be finished in the middle of the year 2006. Those simulators of new generation comprise an advanced technology which involve for example full around projection (compact simulator) or moving platform (light simulator). On the picture fig.2 there is a photo of latest generation of steady based compact simulator with all around projection. The view shows the front part of a 210 DEG cylindrical projection screen. Fig. 2: Compact simulator of new generation, equipped with a large 180° projecting screen.